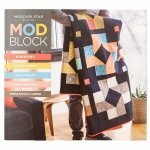 ModBlock has arrived this spring with a lovely new issue for you to peruse. Lately we’ve been intrigued with the importance of harmony in quilt designs. Consider the question, “What makes a quilt work?” We’ve got a few answers for you! It’s easier than you might imagine to create a sense of unity between the details that make up your design. In this issue we’ll help you bring together all the elements that make for a beautifully unique result. In this issue, you’ll learn all about individual pieces that make up harmony including color, shape, line, texture, and size. Then, dig a little deeper and explore quilting as a process and savor each step with the slow stitching movement. And don’t be afraid to get caught up in the latest quilting craze, paper piecing! It’s a lot of fun and great for quilting on the go. Have fun with all these new projects to fuel your imagination and find a brand new harmony in quilting. Thanks for joining us again and we hope you love this issue of ModBlock as much as we loved making it. Enjoy!